Michelle Kinyon serves an organic juice from Guice's drive-through. Partly obscured by the yellow-leaved trees edging the strip mall parking lot, it's easy to miss the tiny gray building as traffic zips up and down the busy South Hill arterial. But those who've discovered Guice, a freshly made juice and smoothie stand and one of the newest additions to the city's bustling southern edge, are likely to head back to the little gray hut for a fast and healthy snack. 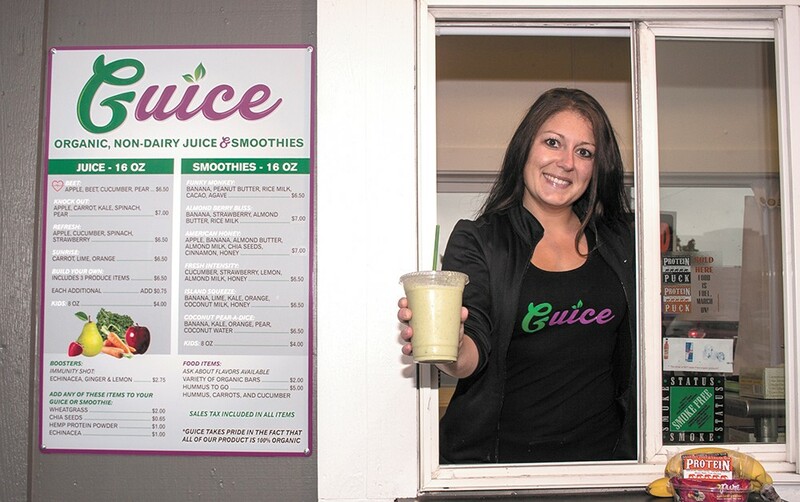 In September, owner Michelle Kinyon opened the juice stand in the parking lot of a retail center housing Ace Hardware, Round Table Pizza and Ferrante's Marketplace Cafe. She ditched her job in the banking industry, hoping to provide her South Hill neighbors their recommended daily intake of fruits and veggies in a more palatable form. "I've seen a lot of change here the past several years, but nothing that sparks or promotes wellness," Kinyon says of the neighborhood. "I feel like there is always that up-and-new restaurant opening, which is great... but what about that daily 'What can I do for my body?'" And with its strategically located drive-through stand, Kinyon is already noticing positive reception from the community. Parents on their way to drop the kids off at school can swing by for a quick morning smoothie or juice without getting the kids out of the car, she notes. The massive Southeast Sports Complex sits just across the street, and Kinyon often serves soccer players and their families who walk over for a postgame refreshment. Guice offers both smoothies and fresh-pressed vegetable and fruit juice blends. All of the products are organic and dairy-free, the latter a choice Kinyon made to cater to customers who may have dairy intolerance. Instead of milk or yogurt, she uses rice, coconut and almond milks. Guice offers 8 oz. kid-sized drinks ($4), but otherwise all beverages are 16 oz., ranging in price from $6.50 to $7, not including any added ingredients like wheatgrass, chia seeds, hemp protein powder or echinacea. While the stand is too small for a kitchen, Kinyon stocks it with organic snack bars ($2) and hummus and veggie to-go packs ($5). While Guice features six smoothies and four juice blends on its menu, Kinyon is happy to customize a drink for customers.